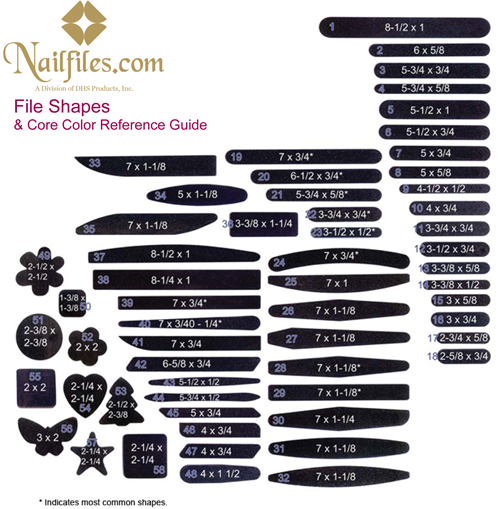 What makes Nailfiles.com services unique is that we offer the customer a personal touch by providing the option of PRIVATE LABELING and customization on almost all of the products viewed on this website! Since we do the manufacturing, packing and shipping right at our facility, we can easily add your company logo and information to the actual nail file or product ordered by you. See below for details. Capable of printing in blue ink only. Can print simple graphics along with text and numbers on a light colored backing such as white, light pink, light blue and yellow nail files. Setup: We offer Set-up Free Printing where all setup fee's are included in the cost of the item. Image area limited to 6" x .75"
Pricing is based on quantity printed. Request a quote. Just send us a digital file and we will print a sample to show how it looks. Capable of printing 1 or 2 colors. Custom colors subject to an additional charge. It is ideal for almost any graphic and can be printed on any colored backing, including black nail files. Image area limited to 5-1/2" x 3"
Capable of printing full 4-color process. It is ideal for any graphic printed on a light colored backing such as a white nail file or buffer. Click Here to see some templates we have created and how we can customize them to you and your business. Please Contact us to discuss the possibilities or request a quote!